1. Marion Robert Morrison, born 26 May 1907; died 11 June 1979. He was the son of 2. Clyde Leonard Morrison and 3. Mary Alberta (MOLLIE) Brown. Copy of Birth certificate on file "Winterset, Madison County, Iowa. 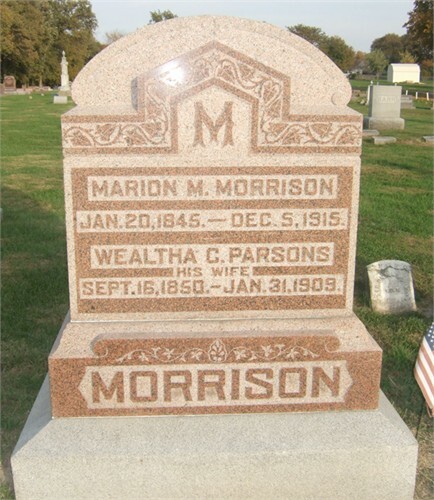 Full name of child Marion Robert Morrison. Parents Clyde Morrison and Mary A, Brown. Date of birth 26 May 1907." The Winterset Madisonian Thursday 30 May 1907 "A thirteen-pound son arrived at the home of Mr & Mrs Clyde Morrison Monday morning"
For addresses 1907 - 1910 see Clyde L Morrison listings in City directories and voters registers. For addresses after 1910 and before 1920 see Clyde L Morrison listings in City directories and voters registers. Copy of Death Certificate on file "Decedant Marion Robert Morrison born 26 May 1907, Place of death UCLA hospital, Los Angeles, California, date of death 11 June 1979"
SSDI " MORRISON, MARION ROBERT, born 05/26/1907, MALE, born IOWA, Died LOS ANGELES (19), 06/11/1979, Social Security number 561-01-2534, age 72 yrs"
Married 3 Times and had 7 children. Melinda (b. December 3, 1940). On November 29 1944, their divorce became final. She died peacefully in her sleep June 24. She had 22 grandchildren and 19 great grandchildren. She was a life long volunteer. "She found great happiness in 1996 when she married Cyril Nigg, a well known LA businessman." In lieu of flowers, donations could be made to the John Wayne Cancer Institute. The funeral was to be held June 27. 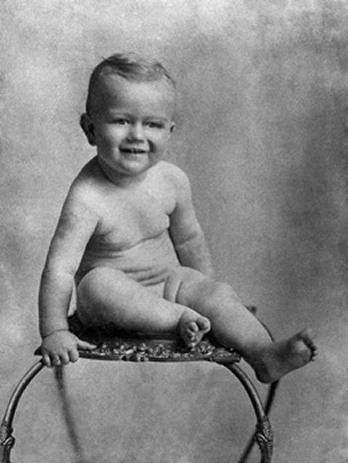 Spouse John Wayne (1946 -1953) (divorced) No Children. Mother of Ethan, Aissa and Marisa. Christopher LaCava, Peter LaCava, David LaCava, and actor Brendan Wayne. After divorcing tennis player, Lornie Kuhl, Aissa married, orthopedic surgeon, Thomas A Gionis, but became embroiled in a bitter custody dispute, over their daughter Anastasia, when the couple separated in 1988. In October of that year, Aissa and her boyfriend, millionaire Roger Luby, were attacked by two gunmen, inside the garage of Luby's Newport Beach home. and sentenced to five years in prison. 2. Clyde Leonard Morrison, born 20 August 1884; died 3 April 1937. He was the son of 4. Marion Mitchell Morrison and 5. Wealtha Chase Parsons. He married 3. Mary Alberta (MOLLIE) Brown. 3. Mary Alberta (MOLLIE) Brown, born 27 September 1885; died 17 March 1970. She was the daughter of 6. Robert Emmett Brown and 7. Margaret (MAGGIE) Cullenan. Born Sumner township, Warren County, Illinois. "Male" Morrison, Birth Record Volume B, page 160, No. 4378, 23 August 1884, County Courthouse, Monmouth, Illinois. George H Morrison aged 21, Guy J Morrison aged 17, Clyde L Morrison aged 10 and Pearl L Morrison aged 8. Second Married to Florence A Buck 1930, no children of this union. Florence already had a daughter called Nancy. Born in Lincoln, Lancaster County, Nebraska. 1895 Iowa state census at Polk, Iowa, United States. Second marriage to Sydney D Preen, no children of this union. SSDI: PREEN, Mary A, born 09/27/1885, FEMALE, born NEBRASKA, Died Orange County, 03/17/1970, Social Security number 550-48-5900, age 84 yrs. Married in Knoxville, Marion Co, Iowa. Clyde L. Morrison & Mary Brown, Marriage Record, 29 September 1905, Volume 9: page 303, No. 1550, County Courthouse, Knoxville, Iowa. 2 Robert Emmett Morrison born in Earlham, Madison, Iowa 18 Dec 1911 (Robert Emmett Morrison, Birth Register Book 3, page 165, 18 Dec 1911, County Courthouse, Winterset, Iowa) and Died 25 July 1970 in St. Joseph's hospital in Burbank, California. 1 i. Marion Robert Morrison, born 26 May 1907; died 11 June 1979. The Morrison brothers: Marion Robert (John Wayne) and Robert Emmett, in 1942 at Robert's wedding to his wife Georgianna. 4. Marion Mitchell Morrison, born 20 January 1845; died 5 December 1915. He was the son of 8. James Morrison and 9. Martha Purdy Ewing. He married 5. Wealtha Chase Parsons. 5. Wealtha Chase Parsons, born 16 September 1850; died 31 January 1909. She was the daughter of 10. Henry Charles Parson and 11. Abigail Buck. Married in Monmouth, Warren Co, Illinois. Marion M. Morrison & Wealtha C. Parsons, Marriage Register, 4 November 1869, Volume C: page 41, County Courthouse, Monmouth, Illinois. 1. George Henry Morrison born 1783. 2. Guy J Morrison born in Illinois August 1877. 3. Clyde Leonard Morrison born 20 August 1884. 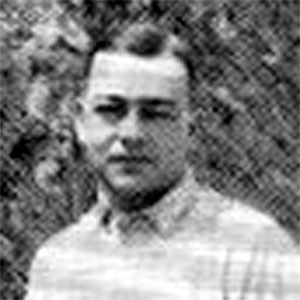 2 i. Clyde Leonard Morrison, born 20 August 1884; died 3 April 1937; married Mary Alberta (MOLLIE) Brown. 6. Robert Emmett Brown, born February 1847; died 3 March 1918. He was the son of 12. Edward Brown and 13. Margaret J Good. He married 7. Margaret (MAGGIE) Cullenan. 7. Margaret (MAGGIE) Cullenan, born August 1851; died 1929. Born in Armstrong Co, Pennsylvania. 1918 Glendale city directory Robert E Brown printer h1246 Valencia. SECOND MARRIAGE FOR BOTH PARTIES? Groom's Mother's Name: Margaret Good. 3 i. Mary Alberta (MOLLIE) Brown, born 27 September 1885; died 17 March 1970; married Clyde Leonard Morrison. 8. James Morrison, born 21 September 1811; died 12 January 1879. He was the son of 16. Robert Morrison and 17. Mary (POLLY) Mitchell. He married 9. Martha Purdy Ewing 18 February 1836. 9. Martha Purdy Ewing, born 15 September 1814; died 25 February 1882. She was the daughter of 18. James Ewing and 19. <Unnamed>. Born in Cherry Fork, Adams, Ohio. 1. James H. Morrison was born Jan 1837 and died 8 Sep 1837. 2. Marion Mitchell Morrison was born 20 Jan 1845. However see 1850 and 1860 census which suggest there were more than two children of this union. 4 i. Marion Mitchell Morrison, born 20 January 1845; died 5 December 1915; married Wealtha Chase Parsons. 10. Henry Charles Parson, born 17 June 1819; died 16 November 1869. He was the son of 20. Eldad Parsons and 21. Betsey Buck. He married 11. Abigail Buck 25 December 1846. 11. Abigail Buck, born 3 March 1827; died 19 December 1900. She was the daughter of 22. Murray Buck and 23. Polly Thorp. Died in Sumner, Lawrence County, Illinois. Died Monmouth, Warren County, Illinois. 5 i. Wealtha Chase Parsons, born 16 September 1850; died 31 January 1909; married Marion Mitchell Morrison. 12. Edward Brown, born 1811. He married 13. Margaret J Good. 13. Margaret J Good, born 1821. 6 i. Robert Emmett Brown, born February 1847; died 3 March 1918; married Margaret (MAGGIE) Cullenan. 16. Robert Morrison, born 28 November 1782; died 10 February 1863. He was the son of 32. James Morrison and 33. Sarah Wilson. He married 17. Mary (POLLY) Mitchell. 17. Mary (POLLY) Mitchell, born 1770; died 28 July 1813. She was the daughter of 34. Gavin Mitchell and 35. Sarah Matthews. Born in County Antrim, Northern Ireland. Died in Cherry Fork, Adams, Ohio. 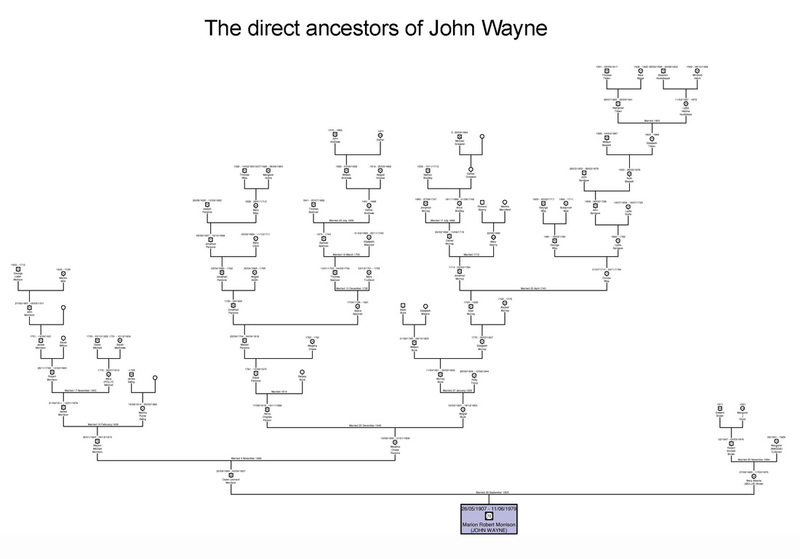 1850 US census at Wayne, Adams, Ohio Robert Marrison aged 72 Farmer born abt 1778 in Ireland Male with Pheba Marrison aged 6, Margaret Marrison aged 24, Wm Marrison aged 22, Matilda Marrison aged 16, Joseph Freeman aged 14 and Elizabeth M Willen aged 6. 1900 History of Adams County, Ohio, Evans and Stivers, 1900, pages 591-593. "Robert Morrison was born in County Antrim November 29, 1782. His father died while he was an infant and he was reared by his mother. .... His education was very meager and when a mere boy he was put out to learn the trade of a linen weaver. Before he was nineteen years of age he was engaged in manufacturing and selling linen cloth. Being of a very adventuresome disposition, he joined the United Irishmen, and as a result of it was compelled to flee Ireland to save his life. ...."
"He came to this country accompanied by his mother and an uncle. He landed at New York in 1801 in the nineteenth year of his age. He went to South Carolina with his uncle and mother to visit two paternal uncles. South Carolina did not impress young Morrison, and he went to Kentucky in 1802, and located near Flemingsburg. 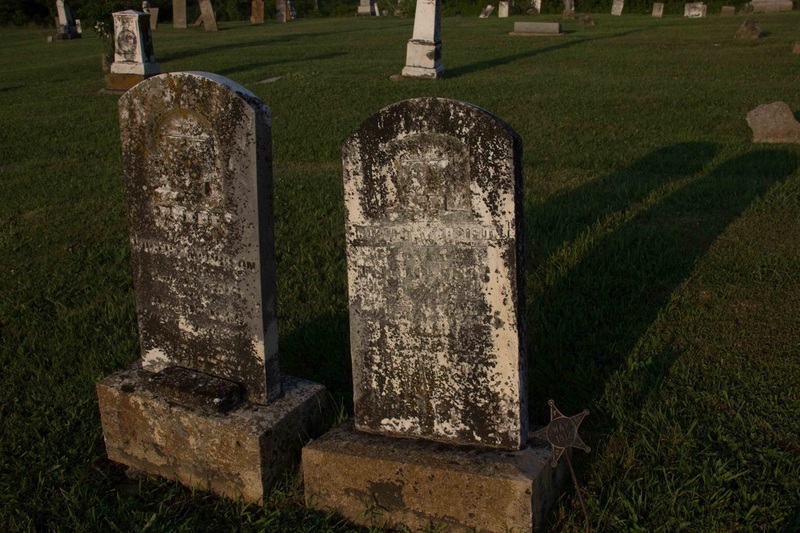 While there he connected himself with the Associated Reform Presbyterian Church, and in 1803 married Miss Mary Mitchell, sister of Judge Mitchell of Preble County [Ohio], and the day after his marriage, he and his bride set out for Ohio. He settled on Cherry Fork [Adams County, Ohio]. .... "
"In 1813 he lost his wife. She left six children, one only seven days old. He was also immediately called into the war [of 1812]. In this he was Captain Morrison, commanding a company of dragoons. On June 28, 1814, he married Miss Phoebe McGowan. .... In December 1817, he was elected to the legislature. He was re-elected in 1818, 1819, and 1820. While serving n the legislature, he was elected brigadier general of the militia. .... After serving four terms in the legislature, he declined denomination. [He served as Adams County associate judge from 1821 to 1851]." "After retiring from the duties of associate judge in 1851, he resided quietly on his farm till he was called hence on the tenth day of February 1863." 2.Mitchell Morrison, born October 9, 1805. 3.Sarah Morrison, born November 25, 1805; died March 1877. 4.Nancy Morrison, born October 21, 1809. Married William O. Ewing. 5.James Morrison, born September 21, 1811 in Ohio; died January 12, 1879 in Little York, Illinois. 6.Robert Morrison, born July 21, 1813 in Ohio. 1.Mary Morrison, born January 21, 1816. Married William Eckman. 2.John Morrison, born August 8, 1817. Married Julia Ann Pitinger; born October 14, 1848. 3.Robert Morrison, born August 12, 1819; died September 9, 1900 in Cherry Fork, Adams Co., Ohio. Married (1) Elizabeth Potter. (2) Elizabeth Ann Patton; born Abt. 1828 in Ohio. 4.Rev Marion Morrison, born June 2, 1821; died September 9, 1890 in Mission Ridge, Nebraska. 5.Elizabeth Morrison, born August 13, 1823. Married William McMillen. 6.William Morrison, born July 20, 1828; died July 29, 1900. Married Alleson (Unknown). 7.Harvey Morrison, born March 12, 1831; died October 25, 1837. 8.Mitilda Morrison, born April 4, 1833. Married (1) Glass. (2) Pittenenger. Born 29 November 1782 County Antrim, Northern Ireland and died 10 February 1863 of Cholera in Cherry Fork, Adams County, Ohio. His Parents are cited as James Morrison and Sarah Wilson OR John Morrison and Nancy Descrogges. In the Adams County, Ohio land records, Robert appears in Adams county land purchase on January 21, 1815 when he purchases 15 3/4 acres of land from Daniel and William John (Vol 8:334) Numerous other land transactions appear for Robert in Adams County, Ohio. "Robert Morrison, a sketch of whose life we now present to the reader, was born in the county of Antrim, Ireland, on the 29th of November 1782. When he was still an infant, his father died, and he was thus left to the sole care of his widowed mother. She was a member of the Presbyterian Church and appears to have been a godly woman. Her instructions and prayers were thankfully remembered by him in all his subsequent life, and frequently spoken of by him even when white and trembling with fear. Not only did she pray for and instruct her son, but she also used the rod. An instance of her doing so was remembered and sometimes mentioned by him, to his friends, as long as he lived. When a mere lad attending school, on account of some dissatisfaction with the teacher, he one day rushed out of the schoolhouse and started home. The teacher pursued him. Robert, finding he was about to be overtaken, caught up a stone, turned at bay. As the teacher came up the young truant hurled at him the stone, which took effect on one of his shins. The teacher went limping back to the schoolhouse, while the fugitive scholar stood laughing at him. On the evening of the day on which this occurred, Robert was informed by his mother, after due reproof and admonition for his disobedience and rudeness to his teacher, that she must chastise him. As her custom was, she deferred this infliction of the chastisement until the next morning. That night was a miserable one for poor Robert. He knew he had done wrong, he had greatly grieved his mother, and he knew that she would punish him severely. In the morning his mother did whip him severely. He felt that he deserved it, and as long as he lived he was thankful that his mother had punished him. In early life Judge Morrison was much benefited also by the instructions of Mr. Brown., the family pastor. When a grey-haired man, remembered how the minister undertook to gain his childish affection taking him into his library room, and permitting him to look over and amuse himself with his books. Brought thus to regard the minister with affection, he was ready to listen to his advice and instructions. The salutary impressions thus made on his youthful mind were not obliterated by time. Often did Judge Morrison in his old age speak of Mr. Brown with affection and gratitude, and allude to his one case as an example of the happy influence which ministers may exert over children. The subject of our sketch did not enjoy what is now termed a literary education. He did not receive even what is now considered a good English education. Reading, writing, and arithmetic as for perhaps as the Single Rule of Three, were the extent of his acquirements. It is probable that his education was interfered with by his being put, when very young, to learn the trade of a weaver. At least before he was nineteen years old, he was engaged in manufacturing and selling linen cloth. Then near the age of manhood he joined the association of "United Irishmen". In after life, he condemned the object of this association and declared it to be his opinion that it was a happy thing in the Providence of God, "United Irishmen" had failed in their attempt to make Ireland independent of the British government. Like many others of the association, he was compelled to leave his native land in order to save his life. He was enabled to escape through help of Lord Fitzgerald, Officer of British Government. This noble man was himself of one of the "United Irishmen", but, commander of British forces in Ireland, and gave all the assistance he could to his former associated. While perhaps his conduct may seem to involve the guilt of treachery and perjury, we can not but rejoice that he became instrumental in saving many valuable lives. Though many of the British people blame our national government for its efforts to crush a wicked rebellion, it is hoped that "when this cruel war is over" our rulers will not be actuated by the vindictive spirit manifested by the British officials in the trail of Emmet, and in hunting after his unfortunate association. Receiving a pass from Lord Fitzgerald young Morrison escaped from his pursuers, and came to America, accompanied by his mother and uncle. He landed at New York in 1801, in the 19th year of his age. This was to him an entrance into a New World indeed. Many years afterward, he often amused his friends by relating his experience and mistakes immediately after landing in America. The ship in which he came over being required, after sailing into New York, to remain for some time in quarantine, he and four other young Irishmen landed in a boat, and took a stroll along the shore. Before they had proceeded very far, they came upon a large black snake. They were very much startled. One of the number, a Roman Catholic, declared "the black beater" to be "the devil", and they all took to their heels, and ran back to the ship. As they were making tracks as fast as they could, one of them, the same who declared the snake to by "the devil", cried out, "Run, boys, run there it is after ye." It was also very amusing to hear him tell how he went into a crowd, after landing in New York, bought water melon, as those around him were doing, got out his knife and tried to eat the rind. His conclusion was that water-melons were a rather unpleasant kind of food. He used to tell also how badly frightened he was the first time he saw fire-flies. He thought the lightening was flashing all around him, and immediately put back to the house from which he had set out. He did not stay long in New York, but proceeded to South Carolina, accompanied still by his mother and uncle. There two of his father's brothers and their families were living, and for a short time he made his home with one of them. Besides his relatives there were also living near him a companion of his boyhood, who, after emigrating to South Carolina, had married an heiress owning a plantation and slaves. She had an unmarried sister, young, handsome, and rich as herself. Overtures were made to young Morrison by his friend in regard to marrying this young lady, his sister-in-law. What his views in regard to slavery at that time were not know to the writer. It is probable that he had then thought but little on the subject, and had no decided opinions in regard to it. It would seem, therefore, that he did not object to the proposed match on the ground that the lady who it was proposed should make him happy was a slaveholder. Indeed at one time he had serious thoughts of accepting the preposition of his friend. Perhaps most young men would at once have embraced the opportunity of courting a young, rich, handsome woman, if only the assurance were given that to propose was to be accepted. But no doubt Mr. Morrison had some of the reflection and prudence in youth which characterized him in more advanced years. He finally determined to pass by the tempting opportunity fearing that the young lady wouldn't in all respects be a suitable companion. In after life he regarded himself as having made a very fortunate and narrow escape. After he had had opportunity of observing the workings and natures of slavery, he very decidedly condemned it as injurious and sinful, and right heartily did he rejoice that he did not involve himself and his children in its contamination and evils. His deliverance in this case, as in every other, he ascribed to the kindness and over ruling power of God. Mr. Morrison’s stay in South Carolina was short. He went to Kentucky with his family in 1802. His sojourn in the Palmetto State was certainly not profitable in a pecuniary point of view. When he arrived in Kentucky, his clothes and money to the amount of two dollars constituted all his earthly possessions. How he was employed in Kentucky, we are not informed, probably in farming. He lived near Flemingsburg, in Fleming County. During his stay here, he made a profession of the Christian religion, in connection with the Associated Reformed Presbyterian congregation under the pastoral care of Rev. John Steele. We have no information beyond the simple fact here stated. He must have been twenty years old. If at this time his character was at all like it was many years afterward, he was sincere in confessing Christ before men; and the performance of this duty was preceded by much serious deliberation and earnest prayer. During Mr. Morrison's sojourn in Kentucky he also got married. The woman of his choice was Miss Mary Mitchell, sister of the late Judge Mitchell of Preble County, Ohio. She was at the time living in her father's family, near Flemingsburg. It is believed that she was a communicant in Rev. Steele's congregation of which her parents were members, and with which her husband had a short time previous connected himself. Long after her death, Mr. Morrison spoke of her as a godly woman and a faithful, affectionate wife. We cannot give the exact date of the marriage; it took place, however, in the fall of 1803. Wedding tours were not fashionable in those days, but in this case the newly married couple had one. The day after their marriage they set out for Ohio. The bride's father and his family accompanied them, and also the bridegroom's mother and uncle. They, however, did not travel for pleasure, but in order to find a place to live. They came to Adams County, and settled on Cherry Fork. By this time (1803) Mr. Morrison had acquired in some way enough of money to purchase a piece of land. The country was then an almost unbroken forest, and the land which he purchased had all to be cleared. He however, had good health, and going to work in earnest he soon had a portion of his land under cultivation. In a short time, however, a serious difficulty arose in regard to title to the land which he had bought and paid for. Adams County is included in what was called "The Virginia Military Lands", these lands were not regularly surveyed, but were divided into farms of every shape and size. As the necessary result, there arose contentions and litigations about boundaries and titles. A claim was set up to the farm which young Morrison had bought and was improving. Not knowing certainly whether he could successfully resist the claim, he determined to secure good legal counsel. Taking his papers, he went to Lexington to consult Henry Clay, then becoming celebrated. Mr. Clay having considered the papers for about half an hour spoke as follows: My friend, I will give you the best advice in my power, for which I will charge you five dollars. Your title to your land is good, and I am confident that I can secure a decision in you favor, in doing so, I would charge you one hundred dollars. If you....promise by paying one half of the original price of the land....better do so (torn place in paper) It will indeed cost more money then to stand a suit, but the latter will annoy you, it may be a long while, and in the meantime you will not be disposed to improve your farm. If you cannot compromise on the terms I have mentioned, you may rely on me, as I will be in attendance on the court in which the case will be tried to secure a decision in you favor." "The advice so frankly given was followed, and a compromise affected. Judge Morrison remembered, with lively satisfaction, the frankness and kindliness in the manners of Mr. Clay, and could repeat the language employed by him in giving his opinion. We thus see one source of that magic influence over men which that remarkable man possessed. In a very brief interview during which nothing was said, except in regard to a legal matter, he made merely by his manner, a favorable impression, which lasted as long as life, upon the mind of one whom he had never seen before, and one who was less disposed than most men to look upon the outward appearance. Mr. Morrison thus remained in possession of his farm, and continued to improve it. As already remarked, the country as yet was almost one continuous forest. A few years before it had been in possession of the Indians. They were still roaming through the country. An Indian trail passed within half a mile of Mr. Morrison's house. It is probable that no white person had died in the country previous to his arrival. At least he dug the first grave in the Cherry Fork burying ground, which then became, as it still is, the burying place of the whole community for many miles around. Such facts as these indicate what difficulties the settlers had to overcome. Mr. Morrison over took an active part in endeavoring to advance the material, moral and spiritual welfare of the country. He was one of those who constituted his family for a short time worshiped with it, having to travel the distance of seven miles. He and others were organized into the A.R. Presbyterian (now United Presbyterian) congregation of Cherry Fork, in 1805. The place of preaching was within two miles of his house. The congregation at this time consisted of twelve or fifteen families. Their first house of worship was thirty feet square, built of logs, daubed with lime mortar, without any floor, and was not provided either with a fireplace or stove. When the congregation called their second pastor, (Rev William Baldridge) in 1809, they promised him a salary half of which was to be paid in "merchantable produce." Such facts as the above show how Judge Morrison, and others of our fathers and grandfathers lived in the early settlement of our country, yet they lived happily, more so no doubt than we, their sons and grandsons. The life of Mr. Morrison for some years after his marriage flowed tranquilly on. He cultivated his farm, enjoyed the esteem and friendship of his neighbors, was living a godly life and was solaced by the endearments of a happy home. But in 1813, about ten years after his marriage, he experienced a severe domestic trial. His wife was snatched away from him by a very sudden death. She left a child about seven days old. She was not supposed to be in danger either by her physician, her friends or herself. A few minutes before death she called her husband to her bedside, told him that she was about to leave him, gave him an embrace and a kiss, and then immediately ceased to breathe. The death was a heavy blow. Being of a patient and affectionate nature, his attachment to his beloved companion was very strong. She had been the solace of his life and the light of her home. Not only did he regard her with the affection due a faithful companion, but also with the esteem and friendship due to an intelligent, amiable and godly woman. But now the dearest object of his affection was snatched away from him; the light of his home had departed and all his earthly hopes seemed crushed in a moment. Life to him had lost its charm. Through six young children, one of them only seven days old at the time of its mother's death, were left to his sole care, for time, overcome with grief and a sense of his sudden loss, he seemed different to all worldly objects. He was raised from his lethargy by this country's call for defenders to repel threatened invasion. Fort Wayne was in danger of falling into the hands of the British and Indians. Leaving his children in care of his mother and an uncle who accompanied them from Kentucky and were living with him, he went out to its relief. On this expedition he commanded a cavalry company, served under Colonel ....amble who was afterward Governor of the State. Concerning this expedition little is known to the writer. It was, however entirely successful. Fort Wayne was saved from falling into the hands of the enemy. There were some skirmished with the Indians, but no serious fighting. The red coats did not appear before the fort. The preparations for defense prevented an attack. In a short time the danger passed and the men were dismissed to their home. During this expedition, an incident occurred which illustrated the prompt and resolute character of the subject of this memoir. When approaching Fort. Wayne, Captain Morrison's company being in the advance, shooting was heard on the right, and the scouts rushed in, bringing word that Indians had been seen in that direction, passing round rapidly, as if to get in front. Just then, a man near the head of the column broke from the ranks in order to pass to the rear. Captain Morrison at once ordered his men to shoot him on the spot. Before the order could be obeyed, however, the man wheeled into his place and declared that he had not intentionally leave the ranks but because of his horse had become unmanageable. Although the captain knew that the man uttered a falsehood in declaring that Gilpin-like, "he went because his horse would, yet on his resuming his place in the ranks, the affair was passed over. It must not be supposed that Capt. Morrison was a hard-hearted unfeeling man. He was a generous, as kind, and as little inclined to harshness and severity as any man we ever knew. His promptly order - to one of his own men to be shot down, resulted from the belief that an example of cowardice would likely lead to disastrous consequences. When "the general call" was made for men in 1814, Mr. Morrison was among the humber drafted. He served as a captain of infantry. Being the oldest captain, by commission, in the regiment to which he belonged, he was for some time acting colonel. He, however, did not see much fighting; he was engaged in skirmished but was in no pitched battle. Once, when an attack was expected, an incident occurred, similar to the one mentioned above. The line of battle being formed, Captain Morrison went to the rear to look after stragglers. He found one of his men, a near neighbor of his own, hid among the baggage. The captain gave him his choice of taking his place in the ranks or of being immediately shot down. He of course preferred the former alternative. He lived many years afterward, and was a very respectable man. He and Captain Morrison continued to be good friends. They never spoke of this affair to each other. Judge Morrison related it a few years before his death to the writer, with the intimation that he wished the name of the individual to be kept secret. during this campaign, Mr. Morrison became acquainted with many men who afterward became very conspicuous; among others was General Harrison, for whom he ever afterward entertained a cordial esteem and friendship. When discharged from the service of his country, he returned to his family and his farm. He was offered a captains commission in the regular army, but not wishing to engage in the military profession for life, he declined the offer. On the 28 of June, 1814, he was married to his second wife, Miss Phebe McGowan, who is yet living; in 1816, he was ordained a ruling elder in the Associate Reformed Presbyterian, now known as the United Presbyterian, congregation of Cherry Fork, of which he had been a member since its organization in 1805. In 1817, Mr. Morrison was elected as a representative in the Ohio Legislature. He was also elected for the next three succeeding years, serving in all 4 terms. About this time, he was appointed Brig Gen. of Militia, and so was generally designated as General Morrison. While in the Legislature, he had for his associates General Harrison, Charles Hammond, Duncan McArthur, and many others who became prominent men. among such men, he of course could not be a leader; besides, his education and his ability as a speaker and a writer did not qualify him to take a prominent part in the deliberative assemble. He did not attempt to figure as a public speaker. Only once did he prepare a speech, and then he completely broke down in the delivery of it. It was at the time an effort was made in the Ohio Legislature to abolish capital punishment. He was determinedly opposed to the proposed change. He wrote out a speech and carefully committed it. When he rose to deliver it, he became embarrassed, hesitated, blundered, and forgot what he was going to say. He, however, abandoned his committed speech, and spoke extemporaneously. He finally delivered what some of his fellow members told him was his best speech. The effort to abolish capital punishment finally failed, though a bill for that purpose came within one vote of passing one branch of Legislature. It is believed that its defeat was owing to the opposition and management of General Morrison. After serving four years in the Legislature, General Morrison declined re-election. The reason of his unwillingness to serve as a legislator was that he feared the influences by which he must be continually surrounded. He did not fear that he would be led into drunkenness, fraud, or any other disreputable vice; but found there was much "wire-working" among the members of the Legislature, and he also found that he "could work the wires as well as any of then. Lest he should in some degrees damage the integrity of his moral character by familiarity with intrigue, he deemed it imprudent to serve any longer as a Legislator. On declining a re-election to the Legislature, General Morrison was appointed Associate Judge of the Court of Common Pleas. With the exception of a part of one term, he served from 1821 to 1850. He was about twenty five years on the bench. No doubt many of the associate judges were mere ciphers, but Judge Morrison was not. He had a good knowledge of the law, and had an opinion on every point brought before the Court. It was not uncommon for him to hold court himself in the absence of the President Judge. He commanded respect of all the lawyers at the bar. He gave encouragement to diffident young lawyers who were endeavoring to rise in their profession, and thus many who rose to eminence became his grateful and ardent friends. He always used his personal influence, when opportunity offered, to persuade men to compose their differences without resorting to litigation. The time taken from business and spent in endeavoring to convince men to submit to some injustice rather than expos involve themselves in the expense and vexation of a lawsuit was a serious loss. Yet, he willingly suffered the loss in order that he might advance the interests of others. He well knew "the law's delay" and uncertainty and expense of and vexations and his advice uniformly was "keep out of the law, if you can.'" The writer has repeatedly heard him declare that he never knew a man to engage in a slander suit, taut did not rue it. After the year 1850, when the office of Associate Judge was abolished, General Morrison held no office of state. He was solicited to become a candidate and was assured of success. But he never had much desire for office and now none at all. In the meantime, he lived on his farm, engaged mostly in manual labor, enjoying the esteem and friendship of all who knew him. When the writer became acquainted with Judge Morrison in 1853, he was bald, of age and trembling with paralysis. His hand trembled with paralysis, that he could scarcely write his name and could not hold a cup to his mouth to drink. Still he enjoyed generally good health, had a fine flow of spirits, took a lively interest in all around him, and was quite interesting and sometimes amusing in conversation. He enjoyed a joke very much but yet was of a very serious turn of mind. He relished a jest, and yet was earnest in prayer. Married Mary Mitchell Polly" on 17 November 1803 in Flemingsburg, Fleming County, Kentucky. Copy Marriage Licence and registry entry on file. 8 i. James Morrison, born 21 September 1811; died 12 January 1879; married Martha Purdy Ewing 18 February 1836. 18. James Ewing, born Abt. 1765. He married 19. <Unnamed>. 9 i. Martha Purdy Ewing, born 15 September 1814; died 25 February 1882; married James Morrison 18 February 1836. 20. Eldad Parsons, born 1791; died 15 August 1870. He was the son of 40. Medad Parsons and 41. Wealthy Chase. He married 21. Betsey Buck. 10 i. Henry Charles Parson, born 17 June 1819; died 16 November 1869; married Abigail Buck 25 December 1846. 22. Murray Buck, born 11 April 1801; died 24 March 1855. He was the son of 44. William Buck and 45. Elizabeth Murray. He married 23. Polly Thorp 27 January 1823. 23. Polly Thorp, born 28 September 1806; died 10 August 1844. 27 Jan 1823 Vermont, USA. 1. William Buck was born in Vermont 12 Sep 1824 and died 17 Sep 1890. He married Charlotte E. Kittel 17 Dec 1846. 3. Abigail Buck was born 3 Mar 1827. 4. Cyrus L. Buck was born in Vermont 24 Dec 1829 and died 22 Aug 1907 in Monmouth, Warren, Illinois. He married Julia Ann Baker in Monmouth, Warren, Illinois, 14 Oct 1852. 11 i. Abigail Buck, born 3 March 1827; died 19 December 1900; married Henry Charles Parson 25 December 1846. 32. James Morrison, born 1751; died 14 August 1821. He was the son of 64. John Morrison and 65. <Unnamed>. He married 33. Sarah Wilson. 1. Robert Morrison born 28 November 1782 in County Antrim, Northern Ireland. 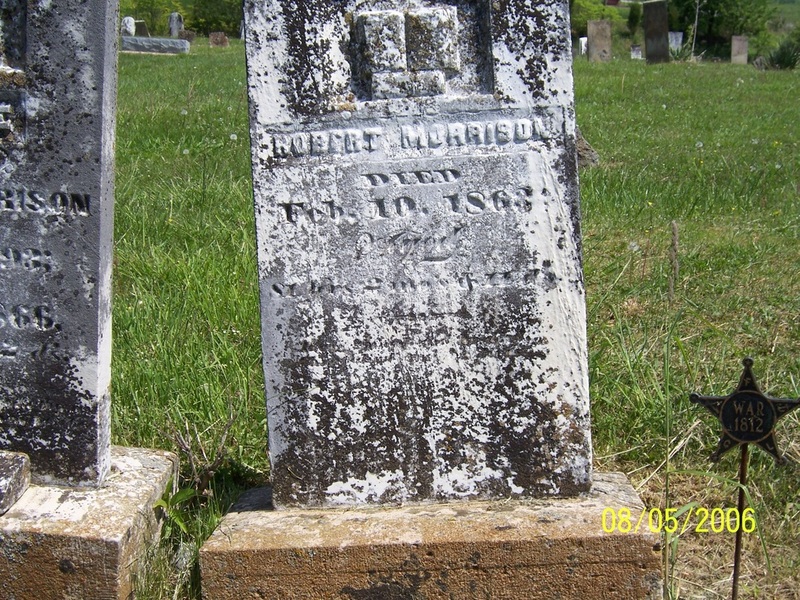 16 i. Robert Morrison, born 28 November 1782; died 10 February 1863; married Mary (POLLY) Mitchell. 34. Gavin Mitchell, born 1755; died 3 October 1820. He married 35. Sarah Matthews. 35. Sarah Matthews, born 1751; died 10 December 1834. 17 i. Mary (POLLY) Mitchell, born 1770; died 28 July 1813; married Robert Morrison. 40. Medad Parsons, born 22 August 1754; died 24 April 1818. He was the son of 80. Jonathan Parsons and 81. Sabra Spencer. He married 41. Wealthy Chase. 41. Wealthy Chase, born 1765; died 1791. 20 i. Eldad Parsons, born 1791; died 15 August 1870; married Betsey Buck. 44. William Buck, born 1 August 1765; died 8 October 1805. He was the son of 88. Isaac Buck and 89. Elizabeth Waters. He married 45. Elizabeth Murray. 45. Elizabeth Murray, born 1770; died 6 March 1807. She was the daughter of 90. Eber Murray and 91. Azubah Murray. 1. Samuel Buck was born 23 Feb 1788 and died 28 Mar 1864. 2. Anson Buck was born 7 Jul 1791 and died 13 Feb 1864. 3. Alura Buck was born 7 Jul 1791 and died before 7 Jun 1793. 4. Alura Buck was born 7 Jun 1793 and died 3 Jan 1868. She married Comfort Barnes. 5. William Buck was born 16 Feb 1795. (78) and died 29 Jun 1843. 6. Daniel Buck was born 8 Dec 1797 and died 21 Mar 1798. 7. Malinda Buck was born 23 Feb 1799. 8. Murray Buck was born 11 Apr 1801. 9. Norman Buck was born in Fairfield, Vermont 13 May 1802 and died 23 Oct 1856. 22 i. Murray Buck, born 11 April 1801; died 24 March 1855; married Polly Thorp 27 January 1823. 64. John Morrison, born 27 August 1667; died 5 May 1701. He was the son of 128. George Lister Moirson and 129. Marion Moir. He married 65. <Unnamed>. 32 i. James Morrison, born 1751; died 14 August 1821; married Sarah Wilson. 80. Jonathan Parsons, born 1720; died September 1800. He was the son of 160. Jonathan Parsons and 161. Abigail Smith. He married 81. Sabra Spencer. 81. Sabra Spencer, born 17 April 1726; died 1821. She was the daughter of 162. Thomas Spencer and 163. Mary Trumbull. 40 i. Medad Parsons, born 22 August 1754; died 24 April 1818; married Wealthy Chase. 88. Isaac Buck He married 89. Elizabeth Waters. 1. William Buck born 1 August 1765. 2. Alfred Buck was born 28 May 1771. He married Mercia Barnes 1795. 44 i. William Buck, born 1 August 1765; died 8 October 1805; married Elizabeth Murray. 90. Eber Murray, born 1745; died 1826. He was the son of 180. Jonathan Murray and 181. Dorcas Way. He married 91. Azubah Murray. 91. Azubah Murray, born 1745; died 1775. 1. Elizabeth Murray was born 1770. 2. Mabel Murray was born in Stockbridge, Massachusetts 7 Sep 1773 and died 15 Feb 1796 in Hinesburg, Vermont. She married Azariah Palmer 4 Nov 1790. 3. Azubah Murray. She married William T. Bush. 1.Dorcas Murray was born 24 Apr 1782 and died 21 Aug 1847. She married Selah Murray. 2.David Scotsman Murray was born 7 Jul 1784 and died 2 Feb 1837. 3. Daniel Murray was born 8 May 1786 and died 1851. 4. Asahel Murray was born 19 May 1788 and died 11 Jul 1854. 5. Lydia Murray was born 4 Mar 1790 and died 7 Aug 1842. She married Harvey Murray. 45 i. Elizabeth Murray, born 1770; died 6 March 1807; married William Buck. 128. George Lister Moirson, born 1643; died 1713. He married 129. Marion Moir. 129. Marion Moir, born 1643; died 1725. 64 i. John Morrison, born 27 August 1667; died 5 May 1701; married <Unnamed>. 160. Jonathan Parsons, born 5 April 1693; died 1782. He was the son of 320. Jonathan Parsons and 321. Mary Clark. He married 161. Abigail Smith. 161. Abigail Smith, born 20 April 1695; died 1755. 80 i. Jonathan Parsons, born 1720; died September 1800; married Sabra Spencer. 162. Thomas Spencer, born 13 January 1701/02; died 4 February 1754. He was the son of 324. Samuel Spencer and 325. Elizabeth Mascraft. He married 163. Mary Trumbull 15 December 1720. 163. Mary Trumbull, born 2 December 1701; died 1755. Born and died 1701 Connecticut. 81 i. Sabra Spencer, born 17 April 1726; died 1821; married Jonathan Parsons. 180. Jonathan Murray, born 1714; died 3 March 1764. He was the son of 360. Daniel Murray and 361. Mary Sperry. He married 181. Dorcas Way 23 April 1870. 181. Dorcas Way, born 1 July 1717; died 24 November 1794. She was the daughter of 362. George Way and 363. Lydia Sprague. Born and died East Guilford, Connecticut. Married 23 April 1740 Connecticut. 1. Amassa Murray was born in East Guilford, Connecticut 24 Feb 1741 and died 29 Oct 1822 in East Guilford, Connecticut. He married Elizabeth. 3. Eber Murray was born 12 Nov 1745. 4. Asahel Murray was born 16 Apr 1747 and died 11 Sep 1784. 5. Jonathan Murray was born 10 Aug 1750 and died 2 Mar 1785. 6. Daniel Murray was born 13 Sep 1755 and died 1 Jan 1842. 7. Stephen Murray was born 16 Jul 1757 and died 6 Jan 1842. 90 i. Eber Murray, born 1745; died 1826; married Azubah Murray. 320. Jonathan Parsons, born 6 June 1657; died 19 October 1694. He was the son of 640. Joseph Parsons and 641. Mary Bliss. He married 321. Mary Clark. 321. Mary Clark, born 3 March 1663/64; died 11 December 1711. 160 i. Jonathan Parsons, born 5 April 1693; died 1782; married Abigail Smith. 324. Samuel Spencer, born 1674; died 1743. He was the son of 648. Thomas Spencer and 649. Esther Andrews. He married 325. Elizabeth Mascraft 18 March 1800. 325. Elizabeth Mascraft, born 1 February 1668/69; died 23 November 1743. Born and died Hartford, Connecticut. 162 i. Thomas Spencer, born 13 January 1701/02; died 4 February 1754; married Mary Trumbull 15 December 1720. 360. Daniel Murray, born 24 February 1691/92; died 15 September 1716. He was the son of 720. Jonathan Murray and 721. Anne Bradley. He married 361. Mary Sperry. 361. Mary Sperry, born 22 June 1690. She was the daughter of 722. Richard Sperry and 723. Martha Mansfield. Born and died in East Guilford, Connecticut. Mary was the daughter of Richard Sperry and Martha Mansfield. She was baptized 22 Jun 1690. Second marriage (after the death of Daniel Murray) to James Vandermark in East Guilford, Connecticut, 27 Jul 1725. Married about 1713 in New Haven, New Haven, Connecticut. 1. Jonathan Murray was born 1714. 2. Mary Murray was born in New Haven, New Haven, Connecticut 19 Nov 1716. She married three times. She married Nicholas Manvil ca 1735/6. She married Joseph Tuttle ca 1751/2. She married unknown Titus. 180 i. Jonathan Murray, born 1714; died 3 March 1764; married Dorcas Way 23 April 1870. 362. George Way, born 1691; died 16 March 1760. He was the son of 724. George Way and 725. Susannah Nest. He married 363. Lydia Sprague. 363. Lydia Sprague, born 1692; died 1762. She was the daughter of 726. John Sprague and 727. Lydia Goffe. Born and died Lyme, Connecticut. 1. Dorcas Way was born 1 Jul 1717. 2. Ireney Way was born in Lyme, Connecticut 1723 and died 1744 in Lyme, Connecticut. She married Jonathan Way in Lyme, Connecticut, 1740. 181 i. Dorcas Way, born 1 July 1717; died 24 November 1794; married Jonathan Murray 23 April 1870. 640. Joseph Parsons, born 25 June 1620; died 10 September 1683. He married 641. Mary Bliss. 641. Mary Bliss, born 1628; died 29 January 1711/12. She was the daughter of 1282. Thomas Bliss and 1283. Margaret Hulins. 320 i. Jonathan Parsons, born 6 June 1657; died 19 October 1694; married Mary Clark. 648. Thomas Spencer, born 1641; died 23 July 1689. He married 649. Esther Andrews 25 July 1658. 649. Esther Andrews, born 1641; died 1698. She was the daughter of 1298. William Andrews and 1299. Abigail Graves. 324 i. Samuel Spencer, born 1674; died 1743; married Elizabeth Mascraft 18 March 1800. 720. Jonathan Murray, born 1665; died 27 August 1747. He married 721. Anne Bradley 17 July 1668. 721. Anne Bradley, born 16 November 1669; died 1 June 1749. She was the daughter of 1442. Nathan Bradley and 1443. Esther Griswold. Died in East Guilford, Connecticut. Married in Guilford, Connecticut, 17 Jul 1688. 1. Daniel Murray was born 24 Feb 1692. 360 i. Daniel Murray, born 24 February 1691/92; died 15 September 1716; married Mary Sperry. 722. Richard Sperry He married 723. Martha Mansfield. 361 i. Mary Sperry, born 22 June 1690; married Daniel Murray. 724. George Way, born 1655; died 23 February 1716/17. He married 725. Susannah Nest. 725. Susannah Nest, born 1660; died 1711. 362 i. George Way, born 1691; died 16 March 1760; married Lydia Sprague. 726. John Sprague, born 1656; died 6 March 1727/28. He was the son of 1452. John Sprague and 1453. Ruth Bassett. He married 727. Lydia Goffe. 727. Lydia Goffe, born 18 July 1658; died 18 July 1725. 363 i. Lydia Sprague, born 1692; died 1762; married George Way. 1282. Thomas Bliss, born 1590; died 14 February 1650/51. He married 1283. Margaret Hulins. 1283. Margaret Hulins, born 15 July 1595; died 28 August 1684. 641 i. Mary Bliss, born 1628; died 29 January 1711/12; married Joseph Parsons. 1298. William Andrews, born 1595; died 3 August 1659. He was the son of 2596. John Andrews and 2597. Esther. He married 1299. Abigail Graves. 1299. Abigail Graves, born 1619; died 20 March 1681/82. 649 i. Esther Andrews, born 1641; died 1698; married Thomas Spencer 25 July 1658. 1442. Nathan Bradley, born 1638; died 10 November 1713. He married 1443. Esther Griswold. 1443. Esther Griswold She was the daughter of 2886. Michael Griswold and 2887. <Unnamed>. 1. Anne Bradley was born 16 Nov 1669. 2. Mary Bradley was born 1672. 3. Abigail Bradley was born 1672. 4. Esther Bradley was born 1677. 721 i. Anne Bradley, born 16 November 1669; died 1 June 1749; married Jonathan Murray 17 July 1668. 1452. John Sprague, born 26 March 1633; died 26 March 1676. He married 1453. Ruth Bassett. 1453. Ruth Bassett, born 1633; died 26 March 1676. She was the daughter of 2906. William Bassett and 2907. Elizabeth Tilden. 726 i. John Sprague, born 1656; died 6 March 1727/28; married Lydia Goffe. 2596. John Andrews, born 1575; died 1663. He married 2597. Esther. Born Coventry, Warwickshire, , England. 1298 i. William Andrews, born 1595; died 3 August 1659; married Abigail Graves. 2886. Michael Griswold, died 26 September 1684. He married 2887. <Unnamed>. 1443 i. Esther Griswold, married Nathan Bradley. 2906. William Bassett, born 1595; died 4 April 1667. He married 2907. Elizabeth Tilden. 2907. Elizabeth Tilden, born 1603; died 1666. She was the daughter of 5814. Nathanial Tilden and 5815. Lydia Hatche Huckstepe. 1453 i. Ruth Bassett, born 1633; died 26 March 1676; married John Sprague. 5814. Nathanial Tilden, born 28 July 1583; died 25 May 1641. He was the son of 11628. Thomas Tilden and 11629. Alice Bigge. He married 5815. Lydia Hatche Huckstepe 1605. 5815. Lydia Hatche Huckstepe, born 11 February 1586/87; died 1672. She was the daughter of 11630. Stephen Hucksteppe and 11631. Winifred Hatch. 2907 i. Elizabeth Tilden, born 1603; died 1666; married William Bassett. 11628. Thomas Tilden, born 1551; died 6 June 1617. He married 11629. Alice Bigge. 11629. Alice Bigge, born 1546; died 1593. 5814 i. Nathanial Tilden, born 28 July 1583; died 25 May 1641; married Lydia Hatche Huckstepe 1605. 11630. Stephen Hucksteppe, born 6 February 1554/55; died 20 June 1633. He married 11631. Winifred Hatch. 11631. Winifred Hatch, born 1552; died 6 October 1592. 5815 i. Lydia Hatche Huckstepe, born 11 February 1586/87; died 1672; married Nathanial Tilden 1605.